Question: How can I extend the life of the rope on my boat? End-for-Ending – This very simple solution is definitely under-utilized. Simply flip your rope around end-for-end to vary stress and abrasion points. For example, the end of the jib sheet attached to the sail becomes the end in the cockpit. 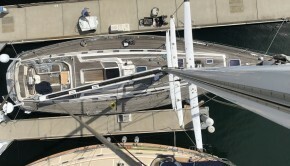 And as you end-for-end each rope, take the opportunity to visually inspect the entire length for damage and uneven wear. Add Technora® chafe sleeve to the section of rope that passes through your clutches. We can do this for you at Rigworks. Consider applying “millionaire’s tape” to abrasion points along the length of your rope. This high pressure, low-friction tape comes in a variety of materials, widths and colors. Rigworks carries two excellent brands… PROtect Tape® and 3M®, which can be purchased by the foot or by the roll. Sky Your Halyards (intentionally!) – If you want to extend the life of your halyards, do what the serious racers do… sky your halyards. Carefully attach a retrieval line to each halyard (or you might be climbing your mast), then pull the halyards into the mast to protect them from exposure to sun and heavy weather. Just to be on the safe side, we suggest that you do not use the releasable part of a shackle to sky your halyards. Cleaning – limit the cleaning of your rope to a fresh water rinse to remove salt particles and loose dirt. If you must use a cleaning solution, stick with a small amount of a very mild detergent in warm water and rinse it well. Avoid contact with anything stronger, especially in the earlier years when the rope still has the coatings and lubricants applied by the manufacturer. Then simply lay the rope out to dry. Never use bleach. Storage – We suggest that you neatly coiling your rope for storage and hang it by an endpoint. Rope stored on the ground is more likely to collect moisture and dirt. 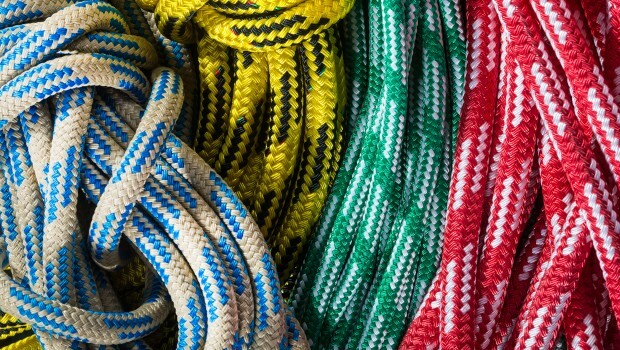 Make sure that your rope is stored dry to avoid mildew and rotting. Avoid kinks and knots which can weaken the fibers in the rope. 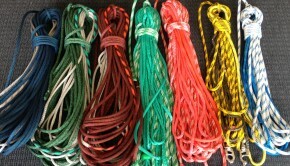 If possible, store your rope in a shady spot out of direct sunlight. Avoid contact with chemicals such as leaking hydraulic fluid, gasoline, oil, acids, etc. Protect Rope ends – Splice where possible. 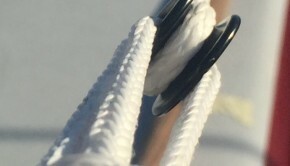 Proper splicing (which we do at Rigworks) creates less stress on your rope than standard knots which weaken rope fibers. Consider adding Dyneema® chafe sleeve to the working end of your rope. 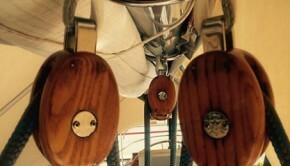 Use halyard balls at the end of your spinnaker halyards to prevent over tightening. Don’t Overload – Make sure that the rope you select is adequately rated for the job at hand. Overloading your rope can result in excessive stretching, diameter reduction & hardening. Don’t Overheat – Samson Rope, one of our favorite rope manufacturers, warns that synthetic rope is very susceptible to heat, including heat cause by friction. Rope that exceeds 250 degrees or is too hot to touch is likely to be compromised. Ask us for recommendations if your rope will be subjected to excessive heat. Enough for now! In our next Ask the Rigger we will discuss how to inspect your rope to decide whether it needs to be repaired, re-covered, or replaced. In the meantime, if you have questions about “anything rope”, please give us a call. We have a wonderful selection here at Rigworks, including a wide variety of strengths, colors, materials and brands. Of course, if we don’t have what you want, we would be happy to place an order to meet your exact needs.